Convert CSV to DOC, PDF, HTML, TXT, XLS, DBF, XML or OpenOffice formats on a web-server with Total CSV ConverterX. It also supports TSV files. The program has no graphic user interface so you do not get any interrupting messages. It can be setup as a standalone client-server application available for users of your local network or serve as a web service available online. A powerful engine of Total CSV ConverterX allows to convert very large volumes of CSV files as fast as possible. When you convert several folders with CSV files the program keeps folder structure. Total CSV ConverterX includes ActiveX so that you could integrate the converter into a web interface. You can select the CSV data to be converted or skip some rows. 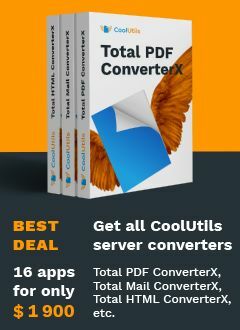 Test Total CSV ConverterX with ActiveX before purchasing for free. Download your 30-day evaluation version here. C.Convert "c:\test\source.csv", "c:\test\dest.pdf", "-cPDF -log c:\test\CSV.log"
"I convert a CSV file to an XLS file on the windows command line. I was open to installing Office but Total CSV Converter managed the task without it. A good piece of software, thank you!" "We had a need to extract several CSV files from different worksheets. Tried several converters, but only this one worked fine. Thank you!"